Hillary Clinton is kvetching about too many things of late. After she saw last week’s Saturday Night Live sketch she was so livid she threw a conniption fit during her face-off with Obama at the Ohio debate. Clinton and her opponent at the Texas debate. She complained about the way in which the comedy show skewed support toward Obama. Although it is doubtful the Illinois Senator had anything to do with how that installment of the NBC script was authored, Clinton went as far as saying Obama should ‘get another pillow’ to prop-up before his television set and enjoy the humour at her expense. It seems the New York Senator only recently received the memo that she will not win, and without an ounce of charisma – a most female asset – to turn her plummeting campaign around, she has become a full-blown cry baby, nitpicking trite and meaningless criticisms and representations of her agenda in the media. Clinton, frustrated by her opponent’s unpunctuated string of victories, attacked Obama over the week-end for circulating pejorative implications of her health-care and NAFTA plans. It seems her campaign aficionados forgot to remind her that they, too, vetoed a “robo call” machinery to smear Obama on issues purported by his agenda. Feeding Clinton’s constant protests is a wave of feminist innuendos that essentially confuse criticism with sexism. That was not all. 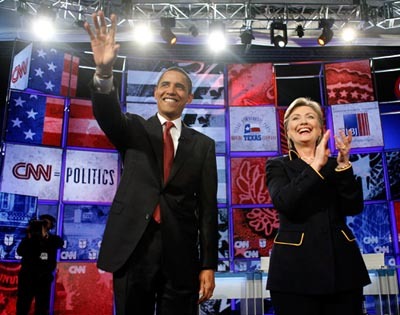 Throughout the debate, Senator Clinton sprinkled her whining seeds and watered them with a monkey wrench when she showed clips that depicted flaws in Barrack’s tool-kit for change. As that failed to nettle her opponent who made jokes about her arguments, she scuffled with the moderator, calling it a matter to note that questions are always pitched at her first. How is this disadvantageous? Does it matter how questions are ordered if your plan and supporting argument are solid? After she burst into tears on the eve of the New Hampshire primary, tee-shirts denoting her ‘fake emotions’ could not sell faster, and after last week’s debate, the media described her black out-fit, piped with yellow stripes, as her gear for her guest role on Star Trek. She has also been called icy and most agree she is. But this kind of raillery is flummery compared to what other candidates endure. A picture of Senator Obama wearing a turban, assigning him terrorist sympathies, is in wide circulation on the net. The Republican front-runner, McCain, is accused of philandering. Back in the John Kerry campaign, he was called a baby killer. This is the nature of the race and those who ran out of steam have a choice. Bow out, not throw a tantrum. Feeding Clinton’s constant protests is a wave of feminist innuendos that essentially confuse criticism with sexism. These feminists, if they had their way, would make it so the importance of supporting Hillary supersedes the importance of ensuring the best candidacy. When the Senator’s vote to support the Iraqi war – an undeniable bete noire of the American people – was called into question, Clinton tried to make light of the matter by stating “if she knew then what she knows now” her decision would have been different. As expected, this response walked into forceful scrutiny from all angles and unearthed feminists who think this type of interrogation is another sign society views women in positions of power with a contempt that perpetuates double –standard.